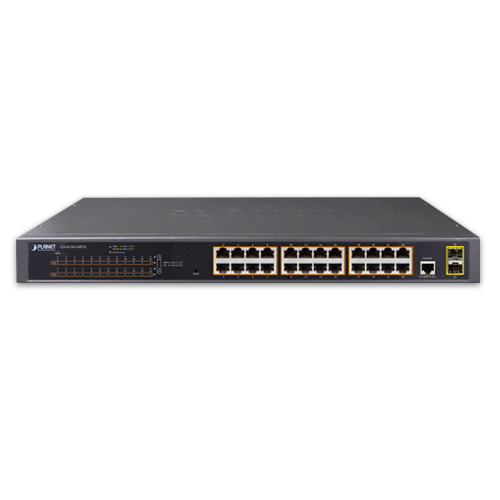 PLANET GS-4210-24P2S is an ideal Gigabit PoE Switch which provides cost-effective advantage to local area network and is widely accepted in the SMB office network. It offers intelligent Layer 2 data packet switching and management functions, friendly web user interface and stable operation. The model complies with IEEE 802.3at Power over Ethernet Plus (PoE+) at an affordable price. The GS-4210-24P2S is equipped with 24 10/100/1000Base-T Gigabit Ethernet ports and 2 100/1000Base-XSFP interfaces with inner power system. Its 24 Gigabit Ethernet ports integrated with 802.3at PoE+ injector function on all ports. It offers a rack-mountable, affordable, safe and reliable power solution for SMBs deploying Power over Ethernet networks, or requiring enhanced data security and network traffic management. 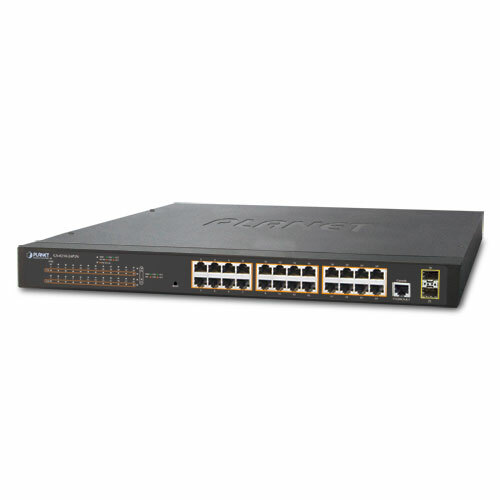 For efficient management, the GS-4210-24P2S is equipped with console, Web, Telnet and SNMP management interfaces. With the built-in Web-based management interface, the GS-4210-24P2S offers an easy-to-use, platform-independent management and configuration facility. By supporting standard Simple Network Management Protocol (SNMP), the switch can be managed via any standard management software. For text-based management, the switch can be accessed via Telnet and the console port. Moreover, the GS-4210-24P2S offers secure remote management by supporting HTTPS and SNMPv3connections which encrypt the packet content at each session.